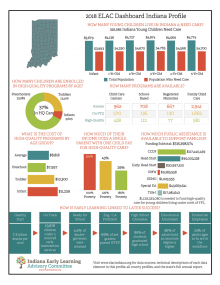 These profiles are designed to provide each county in Indiana with data that will assist them in ensuring that children and their families have access to affordable, high-quality early childhood education programs that keep children healthy, safe, and learning. ELAC has been working to establish baseline data and understanding on key early childhood indicators in Indiana in order to make best practice recommendations. The new ELAC County Early Childhood Profile was developed to provide each county in Indiana with the same data that ELAC is tracking at the state level to assist local communities in ensuring that children and their families have access to affordable, high-quality early childhood education programs that keep children healthy, safe, and learning. The ELAC County Profile equips counties to compare their results with the state and other communities. 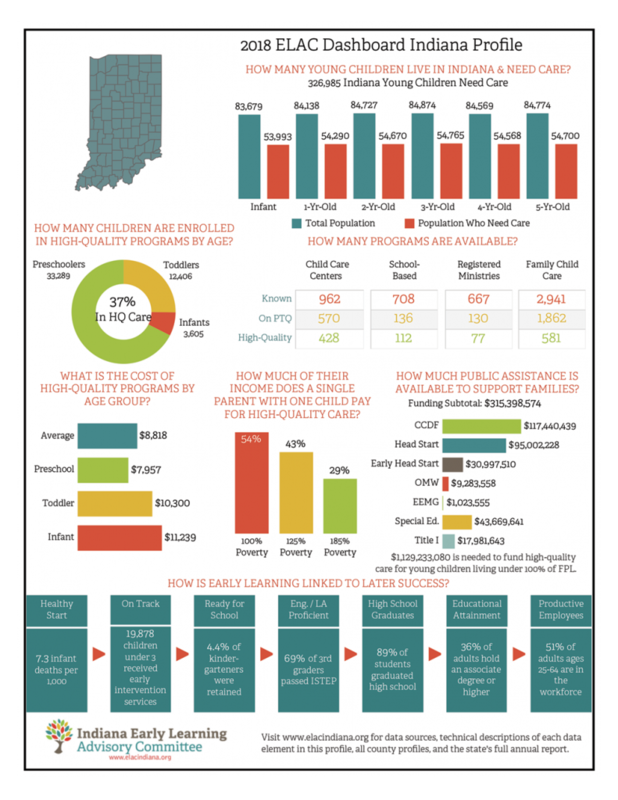 The first page includes 16 key indicators across four focus areas: Young Hoosier Children and Families; High-Quality Early Care and Education Programs; Early Care and Education Workforce; and Kindergarten Readiness. 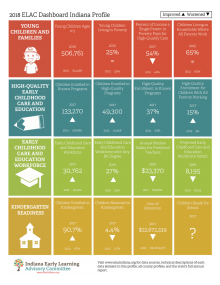 The second page of the ELAC County Profile provides a closer look at the accessibility and affordability of high-quality early care and education in each county. 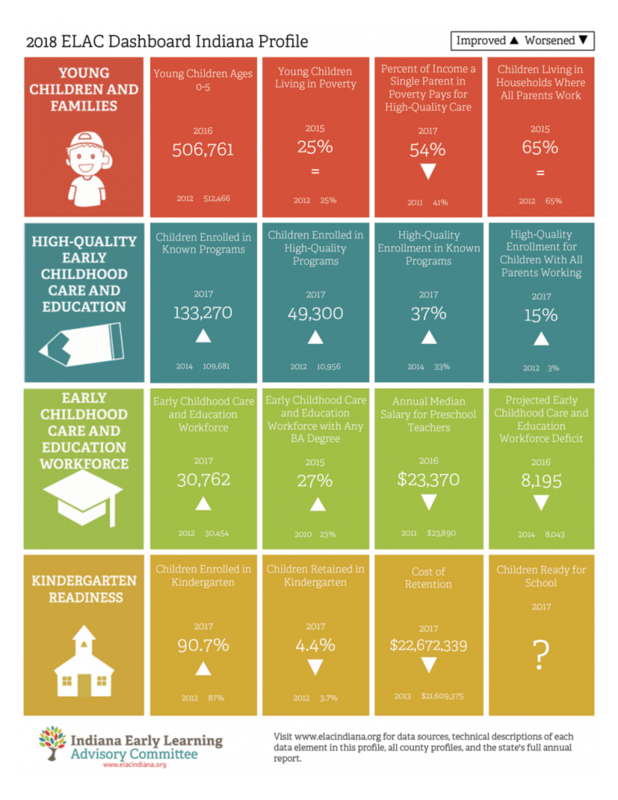 It highlights the relationship between key early learning indicators and educational and workforce benchmarks. When children are on track developmentally at the youngest ages, positive outcomes occur that put them on the pathway to success including being ready for school, reading at grade level, graduating from high school, and pursuing a post-secondary education. That is why ELAC focuses its efforts early on the developmental spectrum. More accessible for all children and families. More affordable for at-risk families. Supported by best practices in all communities. What questions does this raise for us? What is significant about this information? A separate Early Childhood Profile is available for each county by selecting the county on the map or by using the dropdown below. Visit the archive to view the past PDFs and interactive dashboards. The Indiana Early Learning Advisory Committee would like to thank several organizations for their assistance in the development of this report, including the ELAC Data Coordination and System Integration Workgroup, Indiana Association for the Education of Young Children, the Indiana Department of Workforce Development, Indiana Head Start Association, Indiana Network of Knowledge, Indiana State Department of Health, and Indiana University’s Early Childhood Center. A special thank you to the data teams for providing the data: those from Indiana Department of Education, Indiana Family and Social Services Administration Office of Early Childhood and Out of School Learning and Early Learning Indiana’s Partnership for Early Learners. The ELAC County Early Childhood Profile was developed and produced by Transform Consulting Group, who provides project management support for ELAC.